You know that natural flush you get when you're newly in love? 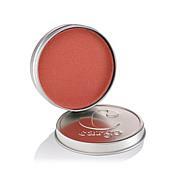 Get that look anytime with this long-wearing blush. Its fade-resistant formula keeps your cheeks looking fabulously flushed through cocktails, dinner, dessert — and anything else that may come your way. Get ready, because you're about to fall madly in love. Ingredients: Ingredients/Ingredients: Mica, Zinc Stearate, Ethylhexyl Methoxycinnamate, Squalane, Dimethicone, Silica, Ethylhexyl Palmitate, Polyethylene, Butyl Methoxydibenzoylmethane, Glyceryl Caprylate, Lauroyl Lysine, Sodium Dehydroacetate, Tocopheryl Acetate, Potassium Sorbate, Carmine (CI 75470). May Contain/Peut Contenir (+/-): Titanium Dioxide (CI 77891), Iron Oxides (CI 77491, CI 77492, CI 77499), Yellow 5 Lake (CI 19140), Red 7 Lake (CI 15850), Red 30 Lake (CI 73360). I go to taekwondo class and its still on when im done :) All day wear at work too. The color Baby Love is a perfect neutral color. Not too pink or peachy. Stays on all day! As my review of the "Love Hangover" blush says I have every color now. These ACTUALLY stay on all. day. long! All the colors are very natural. NO SHIMMER in any of them they just give off a soft, glowing look. Baby Love just looks so amazing on. Be light handed it is very pigmented! I am starting a new trend, since within a week I now have an entire collection of Too Faced products & they are taking over my kit. I am addicted! This is now yet another #TooFacedStaple of mine. 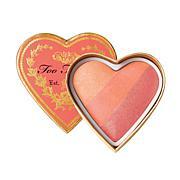 I am one of those people who's blush never stays on! Even as a pro makeup artist I can't get it to stay. It's gone within a few hours. After seeing this & how it said it stays on all day I gave it a go. I am SO happy I did! I have ordered all shades since. 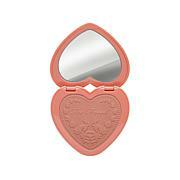 It is the perfect flush in any color and it actually lasts ALL day. The compacts are adorable & the texture is so velvety soft. This is worth every penny! I won't be without this now, ever!! It is yet another Too Faced staple in my kit.